For years, Arq Backup has been often overlooked when talking about backup solutions for the Mac, despite the fact that it is one of the easiest and most flexible options, as well as the most configurable. If you are really concerned about the privacy and security of your backups, you should take a close look at Arq. Today marks the release of version 5 of Arq, a little over 6 years since its first official release, and it contains many awesome new features, but one significant change that I want to highlight right up front is this: Arq v5 moves from a per computer license to a per user license. That means that instead of having to buy a new license for each Mac you own, one license covers them all. This makes Arq a much more affordable option for people who use multiple Macs. It also means this is the time to take a closer look at what Arq offers. a bootable clone made by SuperDuper or Carbon Copy Cloner. a “versioned” backup that keeps multiple copies of files, so if you save a bad version of a file over a good version, you can get it back. Arq does not make bootable backups but does make “versioned” backups. If you have used or seen demos of Time Machine, that is an example of versioned backups, but Time Machine only works for a drive physically connected to your computer, which is easy for desktops, but not to much for laptops. Apple tried to solve this problem with the Time Capsule, which offers the same features as Time Machine, but over the network. At least in theory. Instead I recommend Arq or some other app which will backup without requiring a physical connection to your computer, like Time Machine does, and which uses something more reliable than Time Capsule. “Where can Arq backup to? Those last two are especially important if you want to control your backups from end to end. You could backup one Mac to another, or to a Synology, or to another NAS that you have physical and administrative control of, and know that it was completely secure. Pricing on each service can vary widely depending on how much data you want to backup and how you might need to eventually restore it. 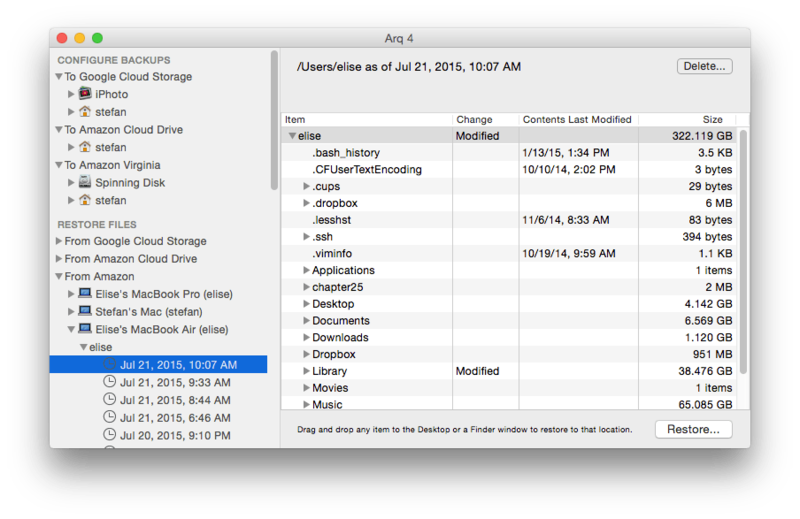 If you have more than one Mac (say, for example, a desktop and a laptop), it’s easy to set up Arq to backup the laptop to your desktop, and then you can backup the desktop using Arq, Backblaze, CrashPlan, and/or SuperDuper or CarbonCopyCloner. If you are looking for the most reliable and least expensive solution over time, buying a 3-4 TB external drive plus Arq is probably the way to go. You can either backup to another Mac on your network or (new with version 5) backup directly to a NAS or other folder on your Mac. Arq has announced their own cloud-based backup service but it is not yet available so I was not able to test it. Getting Arq ready to go is super-simple. You tell it where you want to backup, you enter your credentials, and go. Unlike some providers, such Backblaze, you can choose any files that you want to backup. Want to backup /usr/local/? Ok. /Applications/? Sure. And so on. Have a NAS drive mounted via AFP that you want to backup? Backblaze won’t back that up, but Arq will. You will be asked to enter an encryption key. This is the part that separates Arq from other services. Arq will never ask you to enter that key into their website, because their website doesn’t have your backup information: you do, and only you. Six years of developing for the Mac gives you a good reason to trust that Arq is around for the long haul. The backup format is well-documented so even if the app stops being developed, users should still be able to get their data out of the backups. And in an age where the U.S. government often considers itself deserving of access to any information it wants, you have to weigh the potential security risks of any cloud-based system that does not give you the only set of encryption keys. With Arq you can know that everything is encrypted on your computer before it hits the net, no one has access to those files, and if you really want to be secure, you can make sure you only sync to computers you have direct, physical access to and control over. If you are a new Arq user, Arq 5 is $50/user. That license will work for all your Mac (version 10.7 or later) and Windows (version 7 or later) computers. Arq 4 users can upgrade to for $25, or they can get Arq 5 upgrade plus lifetime upgrades for $55. “What is a “Lifetime Upgrade” and why would I want it?” A “Lifetime Upgrade” means that you will get a license of all future versions of Arq for $0. For example, a few months ago when I decided to buy Arq 4, I paid $50 for Arq 4 plus $30 for the “lifetime upgrade” option, so $80 total. Now that Arq 5 is out, I will get it for $0. When Arq 6 comes out, I will get it for $0. When Arq 7 comes out… you get the idea. Basically you are pre-paying as a way to signal support to the developer now for future versions. I always encourage people to a) test software first to make sure you like it, if you can, and b) buy a lifetime upgrade if it is something that the developer offers. To be clear, I have no personal interest in whether or not you do. I paid for my Arq license outright, long before I even heard that Arq 5 was coming out, and long before I decided to write a review about it. I won’t get any “commissions” or anything like that. I just really like this software and developer. Long-time members of the Mac community know that there are some apps which are not only well-made, but which they are backed by some fantastic developers. Arq is in that league. That matters to me, and I suspect it matters to most Mac users who are thinking about backups. One of the few drawbacks to Arq compared to Backblaze or CrashPlan is that there is no iOS app, so you can’t access your backups from your iPad or iPhone/iPod touch. That being said, I’ve tried CrashPlan and Backblaze’s apps, and they aren’t great. I’ve never been tempted to use either of them again. But if you were in a pinch, they do exist, so that is a consideration. Want all the nitty-gritty details? Read the Version 5 Release Notes. Or just download Arq and try it free for 30 days. That’s more than twice as long as Backblaze offers. 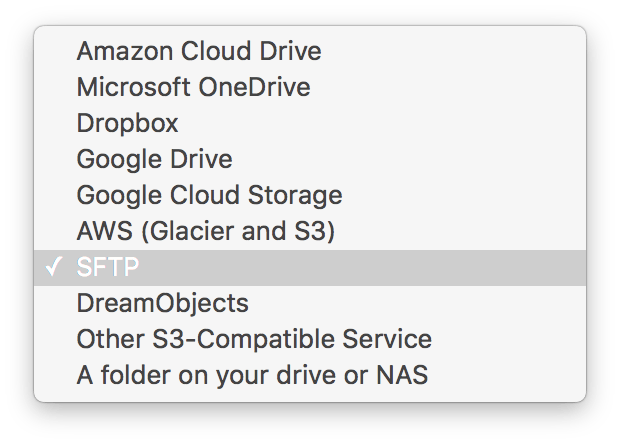 Personally, I am using SFTP to backup to my MacBook to my MacMiniColo machine (off-site backup), as well as my Synology (local backup). I also jettisoned my Time Machine drive and am using that for direct connected backups as well. Although I’ve only been using the demo for a short while, all of the tests I have run have done extremely well. The ability to search backups is great for those times when you know what file you are looking for, but not where it is. As much as I love Backblaze, I have always found restoring from it to be a bit… clunky. Arq “just works” for me. I was a huge fan of Arq version 4, but the pricing structure could keep people away. With the new licensing structure, now is the right time to take a close look at how Arq 5 can fit into your backup strategy. You do have a backup strategy, right? Beyond just “Hope that my drive never dies or that it will give me plenty of warning before it does so I can back it up then.” Right? Right?